Colombian singer Shakira has won six prizes at the annual Latin Billboard Music Awards. The performer's awards included female Latin pop album of the year for Oral Fixation Vol 1 and a special prize for her children's charity work. Four of her awards were for her duet The Torture, with Spanish singer Sanz. 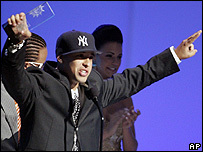 Puerto Rican reggae singer Daddy Yankee was among the other big winners at the ceremony, taking three prizes including top Latin album artist. Shakira, 29, received the Spirit of Hope award, in recognition of her work to improve living conditions for Colombian children. The prizes for her duet with Sanz included hot Latin song of the year. Shakira also performed live with US rapper Wyclef Jean. Dominican singer Andy Andy and Mexican pop group RBD also won three awards each. Daddy Yankee is among the leading figures performing reggaeton, a mix of tropical rhythms, reggae and hip-hop. His other awards included top reggaeton album and reggaeton song of the year, for his collaboration with a group of artists including Baby Ranks and Tonny Tun Tun. Singer-songwriter Joan Sebastian received the Hall of Fame Award after 30 years as a leading figure on the Mexican music scene. The awards show, held in Florida, honours the most popular Latin music albums, songs and performers as determined by sales and radio airplay data published on Billboard's weekly charts.